Kerala, known as 'God's own country', has its own textile tradition. Kerala Sarees are symbolic of Kerala culture and tradition and is not seen anywhere else in India. The elegant Kerala Saree, off white with gold border is unique for their natural colour, texture and golden border. These sarees lend an extraordinary elegance to the person wearing it. Every Malayali woman possesses at least one Kerala sari in her wardrobe. Traditionally women in Kerala also wear a two piece cloth named 'settu mundu', also known as 'mundum neriyathum' with natural body colour and breathtaking border shades, which when worn, exactly look like a saree. The typical Kerala saree is hand woven and is 100 per cent unbleached cotton. It is known for its fineness of count in weaving. The traditional design of a Kerala saree had a 1 inch to 6-7 inch pallu while the body remained plain. But now the pallu goes up to one metre and the border and pallu is decorated with common designs of animals such as peacock and flowers. The sari is now available in checks, stripes and a wide variety of designs as well as in cotton mixed with silk. Men in Kerala wear Kasavu mundu or dhothies during festive occasions. In all places of worship, specially in temples, the most preferred dress is the dhoti. This light pure cotton handlooms edged with golden thread is some times touched with contrasting bright colours. Dhoti's are available in regular, large and extra large sizes. 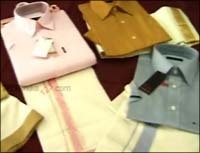 Kerala is also known for its unbleached cotton handloom crepe popularly known as 'kora' cloth which has entered the foreign markets and occupy a proud place in the garment industry. Balaramapuram in Thiruvanathapuram district, the capital of Kerala is the most historically important place for Handloom fabrics, especially the traditional wear. It follows a tradition about 150 years old. It was during the regime of His Highness Maharaja Balaramavarma, which dates back from 1798 to 1810, that handloom weaving was first introduced at Balaramapuram. The weavers here originally belonged to Saliyas community who migrated from Nagar coil and Tirunelveli in Tamil Nadu. They used to produce super fine 'Mundum Neriyathu' for the need of the royal family. The tradition spread from them to the local weavers. The weavers use original type throw-shuttle pit looms for the production of exclusive cotton sarees with pure jari. Besides Sarees, 'Mundum Nereyathum', 'Mundu', 'Earezha thorthu' (bathing towel), 'Melmundu' etc. are woven here. Named after the village of its origin, Chennamangalam handlooms in North Paravur, Ernakulam district is famous for its fine weaving and special effects in the weft direction. Besides sarees, both pure cotton and silk, Chennamangalam also concentrates in the production of settu mundu, earezha thorthu, kavani and super fine double dhothies. Kasaragod sarees from the north of Kerala are masterpieces made with high quality yarn using traditional hand made methods. It is known for the design, quality, varied colour pattern and ornamented jaris or borders. The weaving is done in a unique style by giving care to the thread and applying a special kind of paste to make the saree strong and long lasting. Koothampalli in Thrissur district is also well known for its handloom fabric. Here a community of Devangas who immigrated from Karnataka are engaged in weaving. The 'Kasavu Sarees' which are being produced here is mostly with half fine jari and hence more economical. Koothampalli sarees are preferred by the middle class people for its comparative low prices. The districts of Malappuram, Kozhikode (Calicut) and Kasargode are famous for the 'Malabar loom'. The products, mainly furnishing fabrics, Jacquard products, Bed sheets, Table mats etc. are unique for the excellent texture of the cloth, colour combinations, wide width (98"-120") and craft man ship. Calicut is also famous for its 'Calico cloth'. The history of export trading practice of handloom fabric in Kerala can be traced back to the15th century when handloom cloth of excellent qualities were exported to Asian and European countries. In Kerala, almost 2 lakh weavers are earning their livelihood from the handloom industry, 75% of them in the co-operative line.